So I picked it up thinking I might use it in my 245 class, and it’s every bit as charming as Clark suggest. 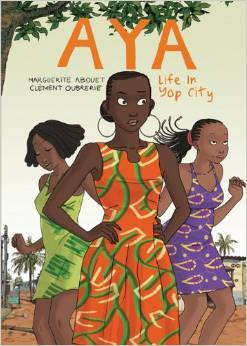 Aya, our protagonist, is a nice girl with big dreams, and she has two friends, Bintou and Adjouna. All boy crazy, with difficult parents, they come up together a working-class section of Yopougon-Koute in the Ivory Coast during the late 1970s. You have to pay attention; the urban aspects of the story are fleeting; the maquis, the housing, the 1,000-star hotel, however, provide a rich and engrossing environment for the story of young men and women trying to find their way. Highly recommended.